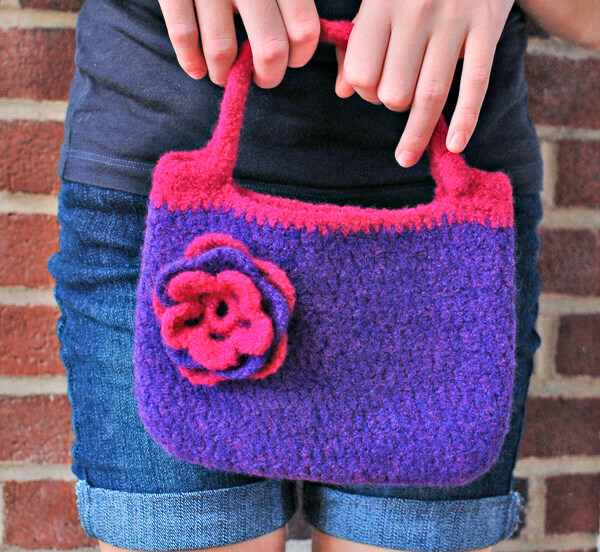 An adorable little felted purse pattern … and best of all there is no lining needed! This little purse is great for when you only need to carry a few things. I also love it to gift to the young ladies in my life! 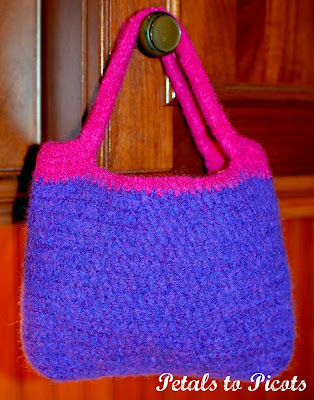 And for the times when you need something bigger, try this larger felted tote. 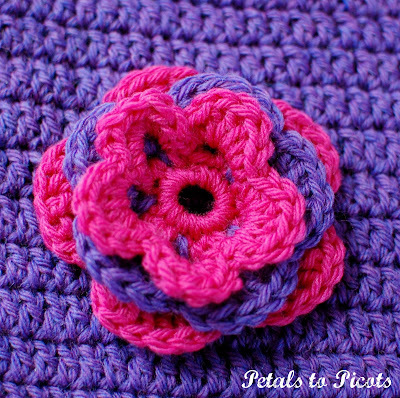 I included the flower pattern I used in the directions below, but feel free to switch it up with any of these free crochet flower patterns. 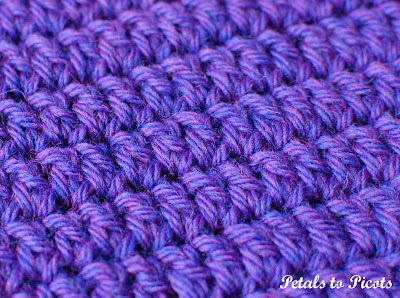 Resources and tutorials you may find helpful in following this pattern: Crochet Abbreviations, U.S. to U.K. Crochet Conversion Chart, Felting Knitting & Crochet. With main color, ch 30 (counts as 26 chains and 1st dc of Round 1). Round 1: Work 4 dc in 4th chain from hook, 1 dc in each of the next 25 ch, 5 dc in last; working on opposite side of chain, 1 dc in each of the next 25 ch, join — 60 sts. Round 2: Ch 3 (counts as dc), work 2 dc in each of the next 3 sts, 1 dc in each of the next 27 sts, 2 dc in each of the next 3 sts, 1 dc in each of the next 26 sts, join — 66 sts. Round 3: Ch 3 (counts as dc), work 1 dc in next st and each st around — 66 sts. Rounds 4 through 13: Repeat Round 3. Round 14: Join accent color; ch 2 (counts as hdc), 1 hdc in next st and each st around, join — 66 sts. Round 15: Ch 2 (counts as hdc), work 1 hdc in each of the next 12 sts, ch 30, skip next 20 sts, 1 hdc in each of the next 13 sts, ch 30, skip next 20 sts, join — 26 sts and 2 ch-30 handles. Round 16: Ch 1 (does not count as st), work 1 sc in same st as join and in each of the next 12 sts, work 40 sc over ch-30, 1 sc in each of the next 13 sts, 40 sc over ch-30 — 106 sts. Round 17: Ch 1 (does not count as st), work 1 sc in same st as join and in each of the next 12 sts, work 40 sc over the sc from previous round, 1 sc in each of the next 13 sts, 40 sc over the sc from previous round — 106 sts. With accent color, ch 6 and join in furthest chain from hook to create a ring. Round 1: Ch 1 (does not count as st), work 15 sc in ring, join — 15 sts. Round 2: Ch 1 (does not count as st), sc in same st as join, *ch 4, skip 2 sts, 1 sc in next, rep from * 3 more times, ch 4, join in first st — 5 ch-4 loops. Round 3: Work [1 sc, 1 hdc, 3dc, 1 hdc, 1 sc] in each ch-4 loop, join — 5 small petals. Round 4: Working behind the petals just made, join main color in 1st skipped st from Round 1; ch 1 (does not count as st), 1 sc in same st as join, *ch 5, skip next unworked st from Round 1, 1 sc in the next unworked st, rep from * around, join in 1st sc — 5 ch-5 loops. Round 5: Work [1 hdc, 5 dc, 1 hdc] in each ch-5 loop, join — 5 medium petals. Round 6: Working behind the petals just made, join accent color in next unworked st from Round 1; ch 1 (does not count as st), 1 sc in same st as join, *ch 5, 1 sc in the next unworked st from Round 1, rep from * around, join in 1st sc — 5 ch-5 loops. Round 7: Work [1 hdc, 1 dc, 5 tr, 1 dc, 1 hdc] in each ch-5 loop, join — 5 large petals. Next we are going to felt our pieces using one of the methods described in Felting Knitting & Crochet. I prefer to leave the flower unattached until after felting because I feel like it gives me more control in shaping the pieces. Once you’ve felted the pieces and gotten the excess water out, shape them as desired. I stuffed the purse with some crumpled newspapers and hung it on a knob to shape the handles nicely. I gave my flower petals some little tugs until they were just how I wanted them and then waited for both pieces to dry. Now just sew your flower to your purse! I liked how this one came out so much that I made another one for myself. You can find my bag and pattern here. 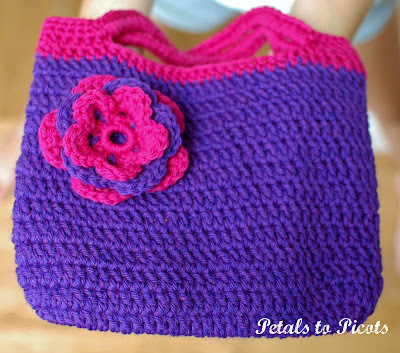 Browse more free crochet bag patterns here. I just found rhis pattern andblooking forward to making it! What are the measurements before felting? Cute purse. I’m trying my luck at this, haven’t crochet in a while. My measurement is way off thou. The width is 9 inches don’t know what the legth is going to be yet. Adorable, felted and unfelted! Thanks for sharing! I just wanted to say thanks for pattern. It worked up and felted beautifully. I made one for each of my five nieces for Christmas and I love how they turned out. I did the flowers in three colors. I’d attached a picture but I can’t figure out how :). Anyway, thanks again. I’m stuck on these instructions. Can you explain the to me. Hi Rose 🙂 No bother at all. I did respond to your email though, not sure why you didn’t get it. Here is what I wrote … I will try to help. First, please note that the 40 sc are worked over the chain-30, not into the chains themselves. These stitches should cover the chain completely and also make it sturdier. And the stitch count is based on 13 sc + 40 sc + 13 sc + 40 sc = 106 (see bolded numbers below). Hope this helps. Please let me know if you have any more questions. Thank you Kara. Now I understand. OVER the whole handle. One little word solved the problem. I read & reread it but that did not sink in. Ps may this question will help someone else. Thank you so much. I understand now that I am making the bottom of the bag. I don’t know where my mind was? I’m starting row 3 & it looks good. Thanks so much for your quick reply. I really appreciate it. I love his pattern & would like to make it but i dont understand the directions. I n your first directions iI don’t understand how you do one double crochet in 25stitches = 60. I’m confused! I’m not very experienced. Hi Rose 🙂 I will try to help … First, keep in mind you will be working on both sides of the starting chain. To begin, you work 4 dc in the 4th chain from hook (this counts as 5 dc, the 4 you made and the 3 chains you skipped counts as a dc), then you work 1 dc in each of the 25 ch across, work 5 in the last chain (this helps you go around the corner to work on the other side of the chain), the work 1 dc in the next 25 ch, and join in top of beginning ch 3. This adds up to 60 sts. Make sense? Thanks so much for sharing this pattern! Very cute and I love felting pieces–especially bags. It makes them so sturdy! What a cute purse!! What yarn did you use to make it? I think I might just try it. Thanks so much for the pattern and info! Both before and after felting are looking pretty ! 🙂 the blend of colours in the purple yarn is more clearly visible in the felted purse. For crochet purses, sometimes I put a lining. 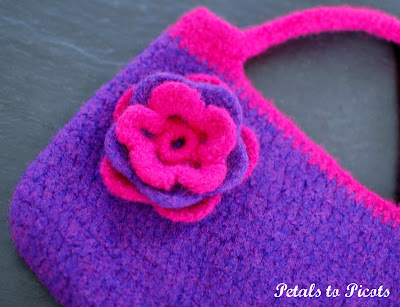 Does the bind of felted purse closes all the gaps in the design so that we can do away with lining? So fun and cute! I love the colors and the flower finishes it off perfectly 🙂 Thanks for sharing! Very cute! Thanks for sharing the pattern!